Sea surface temperature as derived from satellite imagery. The deflection of the Gulf Stream to the east at the Charleston Bump is apparent. Click image for larger view. The Charleston Bump is a deepwater bottom feature 80 to 100 miles southeast of Charleston, South Carolina. The Bump rises from the relatively flat Blake Plateau that lies beyond the edge of the continental shelf off of South Carolina and Georgia. It is a deepwater bank, similar to the Bahamas banks, but does not reach the sea surface. From depths of over 700 m (2300 ft), the bottom ramps up to a shallow scarp at 375 m (1230 ft). From there, the bottom plunges 125 m (410 ft) in a series of steep scarps with rocky cliffs, overhangs and caves. Huge wreckfish, some exceeding 100 lbs in weight, are found associated with the caves and overhangs, and they feed on abundant schools of squid. The Charleston Bump is an essential habitat for these fish, and it is their only known spawning ground in the western North Atlantic. The Bump is the only place in U.S. waters where wreckfish occur in numbers large enough to support a fishery. The Charleston Bump also deflects the flow of the Gulf Stream. As the Stream flows northward out of the Florida Straits, it encounters the Bump and is deflected offshore, causing eddies and other current features that are important fish habitats. This mixing and upwelling brings nutrient rich, deep water to the surface, enhancing plankton production and producing food for fishes. Wreckfish swimming near rocky outcrop on the Charleston Bump. Click image for larger view. The deflection of the Gulf Stream at Charleston Bump also sets up the Charleston Gyre, which is an eddy of warm Gulf Stream water that splits off the Stream at the Bump, and moves inshore. 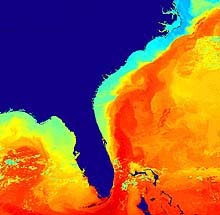 During period of strong Gulf Stream flow, the Charleston Gyre is very prominent, and brings Gulf Stream water close to shore. The combination of rocky bottom and complex currents is attractive to large pelagic fishes such as marlins, sailfish and swordfish, and the Bump area is a commercial fishing ground for swordfish. These billfishes concentrate around the area of rough bottom and near thermal fronts created when the Bump disturbs the flow of the Gulf Stream, causing eddies and gyres where warm Gulf Stream water meets cooler shelf water. Satellite tagging of swordfish (pdf document, 288 kb)at the Charleston Bump shows that although this is an important feeding and spawning area, most swordfish are not resident there. Characterization: Increased research efforts are needed on the U.S. continental slope as fisheries expand into deeper water, seeking out deepwater groupers, wreckfish, ocean perches, tilefishes, alfonsins, roughies, grenadiers and other fish. The fauna of the Charleston Bump and the Blake Plateau has been poorly studied because of the difficulties in deploying nets and other traditional fish sampling gear in deep water under the Gulf Stream. Visual observations from submersible are needed to describe the deepwater fish assemblages, their preferred habitats, and their ecological roles. Sponges and corals growing rocky bottom on the Charleston Bump. Click image for larger view. 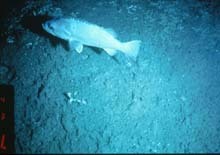 Feeding: Bottom features such as seamounts, shallow banks and other bumps situated on deeper bottoms may enhance food and energy transfer to deep bottom fishes. Wreckfish on the Charleston Bump feed on midwater squids and fishes that undertake diel vertical migrations. In the open sea, these organisms feed in productive surface waters at night, and migrate to depths where they are protected from pelagic predators by darkness, and where cool temperatures conserve energy. Where bottom features like the Charleston Bump occur, these daily vertical migrations impinge upon the bottom, and provide a food source for bottom fishes. Although it is known that these migrations support wreckfish populations on the Charleston Bump, it is not known if other fishes utilize this food source, and what other sources of food might support populations of barrelfish, alfonsins, red bream and other fishery species on the Charleston Bump. We will utilize the submersible to observe daytime activities of midwater animals that might be close to the bottom, near wreckfish, during the day. Recruitment: The Charleston Bump is a spawning ground for wreckfish and wreckfish are apparently recruited to the Bump at an advanced age. Immature small (<80 cm or 31 inches) wreckfish are very rarely caught on the Charleston Bump, and are apparently recruited there as mature fish to spawn. 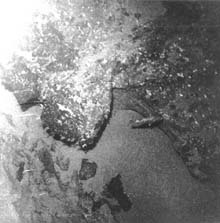 The absence of small wreckfish on the Charleston Bump has not been confirmed visually and an objective of the submersible dives is to look for juvenile wreckfish. Wreckfish swimming near cave and phosphorite rock on the Charleston Bump. Click image for larger view. Productivity: Deepwater rocky bottom habitats such as the Charleston Bump may support greater biomass and diversity of fishes than that found on adjacent soft bottom areas, but additional investigation is needed. During submersible dives, we will compare species composition and abundance of fishes between soft and hard bottom habitats, and compare abundance in hard bottom habitats to that found in other hard bottoms found in the Oculina banks, Gulf of Mexico and Caribbean sites that have been previously observed. Migration: The hard bottom of the continental shelf off South Carolina supports populations of tropical and subtropical reef fishes, which find suitable reef habitat in the form of rock outcrops. Many of these fishes are species that have extended their ranges northward from the Caribbean, taking advantage of "Islands in the Stream" such as patches of rocky reef habitat. It is unknown if the fishes associated with deep hard bottom of the Caribbean extend their range northward along the hard bottom habitat of the Blake Plateau to the Charleston Bump. Similarly, the faunal affinities between the rocky bottom of the Blake Plateau and rocky North Atlantic islands such as Bermuda and the Azores are not known, although fishery landings (e.g. wreckfish, blackbelly rosefish, etc.) indicate many similarities. "Islands" of suitable habitat, such as the Charleston Bump on the Blake Plateau, may provide "stepping stones" to extend the distribution of rocky bottom deepwater fishes from the Caribbean to the eastern Atlantic, assuming that water temperatures and other conditions are favorable. Faunal study of the Charleston Bump is needed to address these questions. 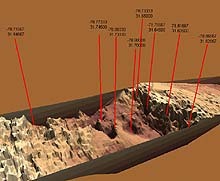 Three-dimensional image of part of the wreckfish grounds on the Charleston Bump. 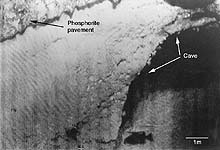 The image represents an area that is about 30 miles long and 10 miles wide. Depths drop from 1230 to 2300 ft at the scarp area. The red lines indicate dive site for the Islands in the Stream Expedition. Click image for larger view. The coupling of oceanography and fisheries production at the Charleston Bump is not well understood. An additional enigma is that the very currents that swirl around the Bump and cause the upwelling should carry away the pelagic eggs, larvae and juveniles of the fishery species such as wreckfish that spawn on the Bump, leaving questions regarding the recruitment of fishes to the feature. There may be downstream eddies that retain early life stages in a "nursery area" associated with the Bump, or recruitment to the Bump may come from upstream in the Caribbean. Additional study of all stages of the life history of deep demersal fishes off the southeastern coast in needed to understand the processes that support populations of these species at such depths. Awareness: Although the Charleston Bump is a prominent bottom feature and an important fishing ground, many people are unaware of its existence. Educational efforts on this Mission will concentrate on providing locations of habitat, descriptions of bottom features, photographs of deep-sea fishes and discussions of the importance of this feature in ecology and oceanography of the southeastern coast. The scientists aboard the research vessel will provide daily logs, photographs, answers to email questions and interviews. The ship will have a satellite phone link to the annual meeting of the South Carolina Junior Academy of Science, meeting in Charleston on 29 September. This will give the opportunity for 400 high school students and teachers to ask questions of the on-board scientists. 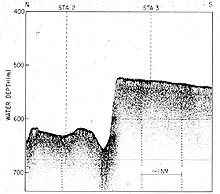 Sonar trace of the wreckfish scarp on the Charleston Bump, showing the extent of vertical relief. Click image for larger view. There is currently very little known about the fishes and other key species of the Charleston Bump. We have some limited observations based on bycatch (catch of non-targeted species) in the wreckfish fishery on the Bump. The following species have been caught in trawl collections in the region from depths exceeding 300 m (984 ft), have been observed from submersible on the Blake Plateau(*), or have been caught and reported by wreckfish fishermen (**). Many kinds of deep-sea sharks are found on the Bump. Economically valuable fishes include wreckfish, barrelfish and alfonsins. Bathymetry map of southeast coast showing deflection of Gulf Stream by Charleston Bump area. Click image for larger view. Large wreckfish on the Charleston Bump. Click image for larger view. The Charleston Bump is closed to pelagic longline fishing from February to April, in an effort to reduce bycatch of non-targeted species and undersized swordfish. Bottom longlining for wreckfish is prohibited (only vertical hook and line may be used), and the wreckfish fishery is closed during their spawning season (mid-January to mid-April). The wreckfish fishery is managed with a quota system in addition to the spawning season closure and gear restrictions. 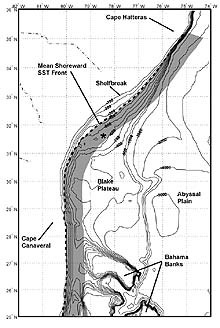 The Charleston Bump is an area of great topographic relief (with scarps of over 400 ft of vertical relief), where the bottom shoals rapidly from 2300 ft up to 1300 ft.
Scarps, rocky overhangs, caves and ridges occur on the Charleston Bump and these habitats support populations of deep reef fishes such as wreckfish, barrelfish and alfonsin. The Charleston Bump is an important pelagic longline fishing ground for swordfish. Tunas, dolphin (mahi), marlins and sailfish also occur in the waters overlying the Charleston Bump. The Charleston Bump is home for the only known population of wreckfish and the only known spawning site for wreckfish in the western North Atlantic. The Charleston Bump deflects the Gulf Stream offshore. This deflection causes upwelling of nutrient-rich water that supports the growth and production of larval fishes for the entire region. 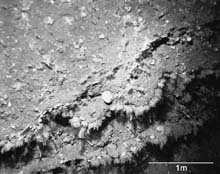 Hard bottom areas of the Charleston Bump support deepwater corals that grow in mounds and pinnacles that extend several meters above the bottom. The Charleston Bump is thought to be a spawning ground for swordfish.